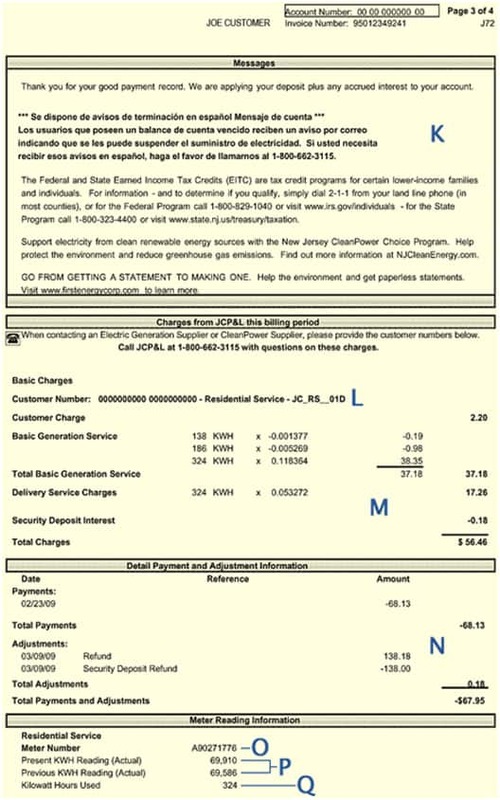 The JCPL electric bill is divided into two sections: Delivery Service and Generation Service. When you choose a lower electric rate at new.electricrate.com, the rate will replace the Basic Generation Service Charges. The delivery charges will remain the same. K – Messages regarding electric service. L – Customer Number is used by alternative electric generation suppliers to identify your Jersey Central Power & Light account. M – Basic charges assessed to all Jersey Central Power & Light customers. N – Payments and adjustments since last billing statement. O – Your electric meter’s serial number. P – Present and previous actual meter reading totals. Note: “Estimated” will appear here if we were unable to read your meter that month. Q – Amount of electricity used in kilowatt-hours (KWH).